Lombardy sightseeing includes some of the most popular vacation destinations in Italy. Lombardy is located in Northern Italy. Some of Italy’s most beautiful areas including the Italian Lakes District where Lake Como and Lake Maggiore are located. Also in Lombardy is the world’s fashion capital Milan. 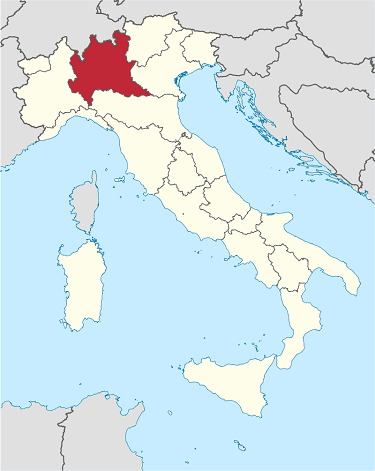 Lombardy is bordered by the southern Alps in Switzerland and Italy’s Trentino-Alto Adige region to the north. To the east is the Veneto region, famous for its popular Italy vacation destinations Venice, Verona, Padua, Vicenza. Italy’s foodie regions Emilia-Romagna is located to the south and Piedmont to the west. Also south of Milan is the Italian Riviera, Cinque Terre, and Genoa, all located in the region of Liguria. For more about Lombardy sightseeing watch the video below. Click here for tours that include Milan and northern Italy. Lombardy includes mountains, lakes, hills and plains. Lombardy’s capital is Milan. A sixth of Italy’s population lives in Lombardy and about a fifth of Italy’s GDP is produced in the region, making it the most populous and richest region in the country and one of the richest in the whole of Europe. Major tourist destinations in the region include the historic, cultural and artistic cities of Milan (which is Italy’s second top tourist destination), Brescia, Mantua, Pavia, Como, Cremona, Bergamo, Sondrio, Lecco, Lodi, Varese, Monza, and the lakes of Garda, Como, Maggiore, and Iseo. The official language, as in the rest of Italy, is Italian. The traditional local languages are the various dialects of Lombard (Western Lombard and Eastern Lombard), as well as some dialects of Emilian, spoken in some parts of the provinces of Mantua, Pavia, and Cremona. Click here for more information about Milan Sightseeing. Our top spots to stay are Cadenabbia and Varenna. 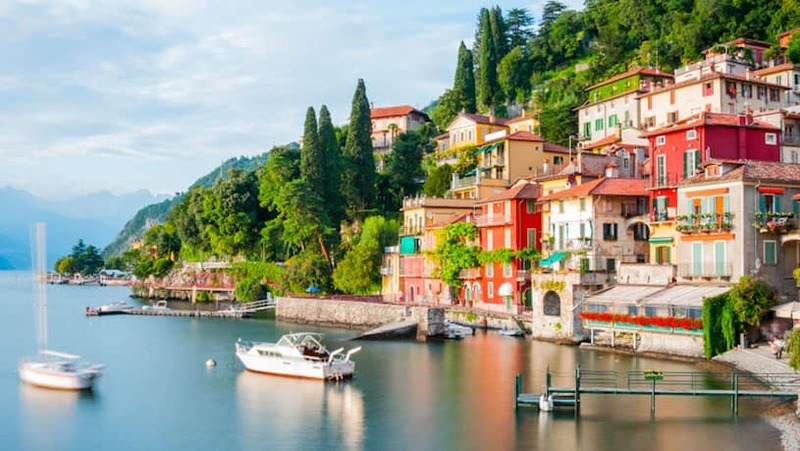 Varenna is the perfect location to explore Lake Como. Honeymooners and couples will find plenty of romantic moments in Varenna. It has nice promenade to walk along, tiny harbor, and is accessible from Milan by train. From Varenna you vacationers may explore Lake Como and its lakeside towns by taking what we call the ferry-go-round. Traveling by ferry around Lake Como you can visit Bellagio, Cadenabbia, Cernobbio, Como, Lenno, Menaggio, and Tremezzo. Albergo Milano located right in the center of Varenna is an easy place to stay for a romantic comfortable Lake Como vacation. Reserve a lake view room and savor the moments inside and out. Albergo Milano includes a restaurant on site serving local seasonal fresh northern Italian food. From there travel around Lake Como by ferry first to Bellagio, where you can enjoy lunch & shop. We like to eat at Ristorante alle Darsene di Loppia. Then stroll through the gardens of the neo-Classical Villa Melzi, a shortcut to the lakeside promenade that leads back to the ferry pier in Bellagio. From Bellagio hop aboard the Lake Como Ferry and travel around to Lenno, where you can enjoy a nice walk. Then head to Menaggio, to shop and sip a local red wine like Sasella. End the ferry-go-round day in Tremezzo for dinner at sunset. You’ll enjoy views across to Bellagio.